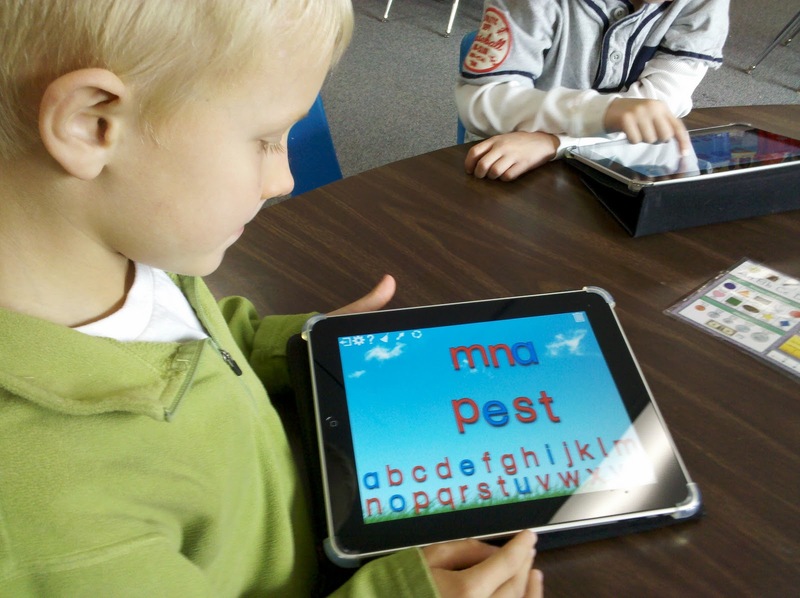 Two of my favorite apps to use as teaching tools in my classroom are based upon the Montessori Approach to education. For those unfamiliar with Montessori, I've copied some information from http://www.montessori.edu below my review of the apps. One that I have found very useful is the Hundred Board: Montessori Approach to Math ($2.99). My students chose to play this one even during free choice time when they can choose from any app on the iPad. It takes the place in my classroom of number board and 100 tiles. If you can imagine the difficulty of organizing 100 number tiles for each student (and what to do with the set when they lose one piece!). More importantly though, is the vocalization of each number as it's selected, and the child is unable to place a number incorrectly. In the last update they added the choice to sequence the numbers with "control" meaning the numbers are displayed to help students pick the next number. The numbers can be placed by ones, evens or odds. The same creator (Rantek Inc.) made the Roman Numerals! ($1.99) app in the same format as the Hundred Board. The student can pick to go from 1-100 by ones, or evens or odds using Roman Numerals. I would suggest this app for grades 3&up. A new app, to me, that I will use on a regular basis is ABC Sequence ($1.99), which is similar to the previous apps, in that the student will put the alphabet in order, using capital or lowercase letters. The letter name is announced "G is for giraffe" when the child selects it. The Montessori Teaching method is evident in these apps - "Teach by teaching, not by correcting Instead the child's effort and work is respected as it is. The teacher, through extensive observation and record-keeping, plans individual projects to enable each child to learn what he needs in order to improve." -www.montessori.edu All of these apps do not have sounds or graphics that indicate the child made a mistake, nor do they move on to the next question without allowing the child to find the right answer. Instead the incorrect choice is minimized and the child tries again. The beauty of most of the apps produced in the Montessori Approach is their simplicity. The 100 board, ABC sequence, as well as the Geography app are powerful applications and ideal for classroom use. The following apps are beautiful and simple too, and may be found useful in preschool or special education classrooms. A Montessori Approach to Vocabulary focuses on common vocabulary objects; a shadow of an object is shown for the child to guess the object, then the photo can be shown and the word can be pronounced aloud. A Pre-Language Exercise- Opposites shows two opposite words (big & small) and a picture of objects that are opposite in size. Brown Stair and Pink Tower asks the student to follow a plan to recreate a tower/stair combination by selecting the next smallest or largest piece in the pattern. Both my 2 year old and 7 year old were happy to play through the levels. I have purchased 100 Board and sampled the lite versions of Geography and ABC sequence. A developer for Rantek Inc, shared codes with me so that I could review the above mentioned apps. Thank you! Another favorite Montessori based app created by another developer (L'escapadou) is Montessori Crosswords ($2.99)- the crosswords are great for spelling words from simple CVC to long vowels and compound words, but I especially like the movable alphabet for use in my making words lessons. Most of these apps have a lite version for you to try before you buy! So go ahead, try them!